Grp78 (BiP) pAb;mouse, rat, bovine, fungus (Cryphonectri mus musculus	murine Grp78 (BiP) pAb;mouse, rat, bovine, fungus (Cryphonectri detects proteins from variouse species most likely human. Specificity: Recognizes mouse, rat, bovine, fungus, hamster, monkey, rabbit and XenopusGrp78. 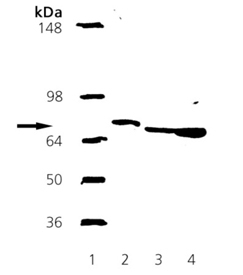 Detects a band of ~78kDa by Western blot. Miscellaneous/General: Grp78 (Glucose Regulated 78kDa Protein), is also known as BiP or Immunoglobulin heavy chain binding protein. It is a stressresponse protein which is induced by agents or conditions that adversely affect endoplasmic reticulum (ER) function. This protein is essential for the proper glycosylation, folding, and assembly of many membrane bound and secreted proteins as well as for maintenance of cell homeostasis and the prevention of apoptosis. Western blot analysis: Lane 1: MW marker, Lane 2: 150 ng of Grp78 (BiP) recombinant protein, Lane 3: 20µg of CHO-K1 cell lysate, Lane 4: 20µg of mouse liver microsome tissue extract.